If you want to get a taste of a typical traditional island feast, then you can combine your swim at Perissa with some fun. 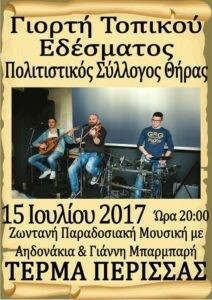 The Cultural Association of Thera is organizing the event with live music, dance, food and plenty of local wine of course. The feast takes place at the final stop of the local bus, near the mountain, in Perissa and starts at 20.00. Free entrance.